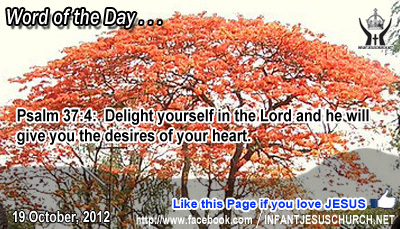 Psalm 37:4: Delight yourself in the Lord and he will give you the desires of your heart. Heavenly Father, we confess to you that so frequently our heart is full of selfish things. But in moments like these, we recognize that you are what we most need and your will is our heart's desire. Please encourage your Spirit in us so that we may see through any selfish dishonesty that would rob us having you first in our life. Forgive us when we are petty, selfish and shallow. May we know you as much as possible for a earthly to know you, not so that we may be full, and that you may be honored. In the name of Infant Jesus we pray. Amen. The fear is a powerful force. It can lead everyone to panic and flight or it can encourage us to faith and action. The fear of God is the remedy to the fear of losing one's life. I sought the Lord, and he answered me, and delivered me from all my fears. ___O fear the Lord, you his saints, for those who fear him have no want! ___Come, O sons, listen to me, I will teach you the fear of the Lord." (Psalm 34:4,9,11) Then what is godly fear? It is respect or wor0ship for the One who made us in love and who upholds us in mercy and ki3ndness. The maximum injury or loss which we can understand is not physical but spiritual - the loss of one's soul to the power of hell. A strong fear of God leads to spiritual prime of life, wisdom and right judgment and it frees us from the oppression of sinful pride, deceit and cowardice - especially in the face of evil and spiritual dishonesty. Do we trust in God's grace and mercy and do we submit to his word? Loving Infant Jesus, may the light of your word free our heart from the dishonesty of sin and consume us with a burning love for your truth and righteousness.